Lock in a great price for Villa Lorena Málaga – rated 9.1 by recent guests! Very nice facilities the swimming pool is really nice to have a little deep anytime. Everything was very clean and the staff is very friendly. The staff are very nice and helpful. Breakfast is not varied but decent 8.30 till 10.30 with fresh orange juice as bonus. There is a machine with a good selection of drinks and snacks at the reception. The bed in the suite is real king size and comfortable. We liked the interior design. Area is quiet, away from the centre. Excellent idea with bikes for use, 15min ride to the old town. Beautiful boutique hotel. Lovely and incredibly helpful staff. Very clean. Quiet. Very good breakfast, lovely interior. Easy to get to the city center with public transport. Attentive and helpful staff - provided a lot of tips for our visit. We had a great stay, thanks! Great calm place in the Limonar district of Malaga. Amazing breakfast. Very friendly and helpful staff. A lot of activities (pool, bicycles). Malaga beach is in a 5 minute walk. Very beautiful place. We've been here for the third time and will definitely come again. Located in El Limonar, a quiet residential area only 5 minutes’ walk from the beach, Villa Lorena is a charming villa offering a private outdoor swimming pool and free WiFi. Free bikes are also available. 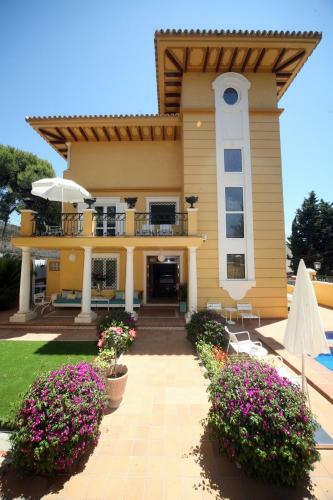 Villa Lorena Málaga features 7 bedrooms, which have been perfectly decorated. All air-conditioned rooms offer a private bathroom with hairdryer, a safe, flat-screen TV and coffee maker. The Villa has a garden and a sun terrace. Staff at the tour desk is happy to provide tourist information about the area. Malaga City Center is 5 minutes’ drive from Villa Lorena Málaga or a 10-minute bike ride away. Guests can visit the Picasso Museum or taste the local food in one of the numerous bars and restaurants nearby. When would you like to stay at Villa Lorena Málaga? Located on the ground floor, this air-conditioned room features a flat-screen TV and private bathroom. It also offers views of the garden. This air-conditioned room features a flat-screen TV and private bathroom. It also offers a balcony with pool or garden views. This air-conditioned room features a flat-screen TV and private bathroom. It also offers a terrace with pool or garden views. This spacious air-conditioned Suite features a flat-screen TV, sofa, mini-bar and private bathroom. It also offers pool or garden views. House Rules Villa Lorena Málaga takes special requests – add in the next step! Villa Lorena Málaga accepts these cards and reserves the right to temporarily hold an amount prior to arrival. Please inform Villa Lorena Málaga of your expected arrival time in advance. You can use the Special Requests box when booking, or contact the property directly using the contact details in your confirmation. You have to wait 5 minutes for hot water each time you come back to the room. The coffee type used for breakfast is not the best, which is a pity as the machine is good quality. This hotel is rather expensive but understandable for a boutique hotel. No soundproofing, you can hear everything that´s happening in the hallway/ first floor very well. Pillow was not particularly neck friendly. Extreme friendly staff. The suite is excellent. The breakfast is good. 5 - 10minutes walking to the beach. Ca 30 - 45 minutes to the centre. Bycicles are available for free. The room however was pretty small and minor details showed the rather cheap finish (largely Ikea) - chipped laminate, wobbly shelves, stained mastic in shower. The bathroom and especially the shower was tiny. The hotel is truly charming. The staff will do all they can to make you feel welcome and happy. Great location too, because it is near the bus stop and the bus takes you to the centre in 5 min. The hotel offers a lovely bike for free too, which is a great way to move around town.